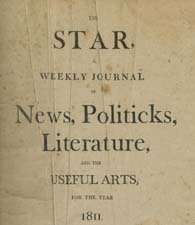 Joseph Caldwell, 1773-1835 University of N.C. Account of Disturbances Which Have Lately Occurred at the University of This State. From The [Raleigh, N.C.] Star, September 13, 1811, p. 148. University of N.C. Account of Disturbances Which Have Lately Occurred at the University of This State. From The [Raleigh, N.C.] Star, September 13, 1811, p. 148. [Raleigh, N.C.]: [Thomas Henderson, Jr.], . Disorderly conduct -- North Carolina -- Chapel Hill. School violence -- North Carolina -- Chapel Hill. Student suspension -- North Carolina -- Chapel Hill. University of North Carolina (1793-1962) -- Riot, 1811. University of North Carolina (1793-1962) -- Students -- Conduct of life.